Hanuman occupies a very exalted position in Indian psyche. 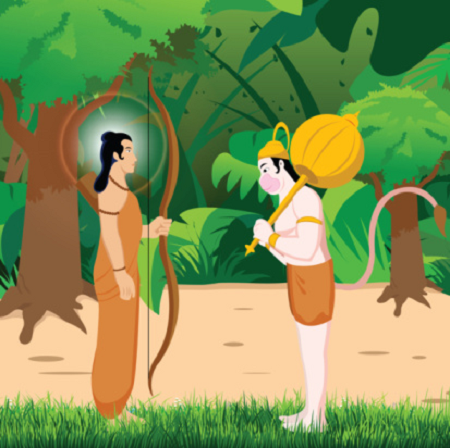 He plays a very pivotal role in the great epic Ramayan. On a spiritual plane, it is said that Hanuman is Lord Ram himself, on an emotional plane he is Ram’s friend and in a normal plane he is Lord Ram’s servant! It will be no exaggeration to say that the Ramayan is, in fact, an adventure of Lord Hanuman. He had the extraordinary power to become very large or very small depending on the situation. He was the greatest devotee of Lord Ram. Legend goes that when he was born he was hungry and asked mother Anjana for food. Clever mother showed him the rising sun and asked him to go up and satisfy himself. Went up Hanuman to the sun (Yug sahasra yojan par Bhanu, lio tahi madhur phal janu); the angry sun cursed him, ’Be powerless till you meet Lord Ram.’ It was a boon in disguise: Unless he remains weak, he may become destructive with his immense strength, and more importantly he is destined to meet Lord Ram.’ A dream of any devotee! More significant is the wisdom of mother Anjana. She sent Hanuman to Sun god, the source of all energy, effulgence, learning and wisdom, to acquire these attributes. Hanuman served Lord Ram as his most faithful and reliable lieutenant and helped him to score victories of good over evil, including the killing of Ravan. He alone could cross the sea to locate goddess Sita, did an encore to gather medicinal plant to revive Lakshman who was felled by Indrajeet, the valiant son of Ravan. Lord Hanuman helps all to get rid of grief, disease and sorrow (Nasai roga harai sab pida, japat nirantar Hanumant veera). He is immortal, and rules over four epochs (Char yuga pratap tumhara, hai parasiddh jagat Ujjiara). It is the birthday of this benevolent Lord. Let us say our prayers to him and chant his name for the welfare of mankind. May he be victorious (Ram Lashan Janaki, Jai ho Hanuman ki).